The visual identity standards and other design tools outlined below were developed by the Office of Communications and External Relations, in conjunction with collaborators across the University, to help you communicate effectively with the wide range of audiences that the University addresses. While the use of McGill’s official logo should adhere to strict standards, there is room for creativity, for example through a choice of typefaces and the pairing of official colours with complementary secondary colour palettes. Also, templates for specific communications materials provide for more than one option and will evolve over time. We encourage you to logo.communications [at] mcgill.ca (contact us) with any questions or particular requirements you may have. Quality photography and effective graphics and layouts. adhere to mutually accepted standards, we are helping to build and enhance McGill’s reputation worldwide. It enhances visibility for the University. It enhances the impression of a cohesive and focused institution. It results in communications that look more professional. It serves as a unifying force for members of our diverse community. The University’s logo and related elements are registered trademarks. Their use by third parties* – any person or organization other than those employed by the University or acting as its agent – is thus prohibited, except where written authorization has been obtained from the logo.communications [at] mcgill.ca (Office of Communications and External Relations) or where the University has entered into a written agreement permitting such use. Faculty and staff shall refrain from encouraging use of the trademarks by third parties unless specific approval has been obtained. *McGill students and student organizations are considered third parties and are not permitted to use McGill’s trademarks, except where approved in writing. The University logo is a trademark composed of two basic elements – the shield icon and the wordmark. The following pages illustrate the elements associated with the logo, their relationship to each other, proper and improper usage and special applications. The shield’s shape and main elements – in particular the martlets – are a strong and familiar visual. The three red martlets on a silver background (white, for the University’s purposes) are taken from the arms of the family of James McGill, the founder of the University. The open book at the top of the shield is the heraldic symbol of an institution of learning. The book bears the words In Domino Confido (“I trust in the Lord”) which was the motto used by James McGill. Two crowns, one on either side of the book, refer to Montreal’s royal name and are composed of fleur de lys as a reminder of the city’s French origin. Montreal’s three hills are represented by three peaks above the martlets. The wordmark “McGill” is custom-designed, meaning the six letters – based on the Garamond typeface – have been designed as a single image and cannot be typed as a word. It is not possible to reproduce the wordmark with standard printing typefaces and other typefaces may not be substituted. The McGill Coat of Arms consists of two parts, the shield and the scroll. It is reserved for special circumstances and should not be used as a substitute for the logo. The Coat of Arms is derived from an armorial device assumed by James McGill. The University’s patent of arms was granted by England’s Garter-King-at-Arms in 1922 and registered in 1956 with Lord Lyon King of Arms in Edinburgh and in 1992 with the Public Register of Arms, Flags and Badges of Canada. In heraldic terms, the coat of arms is described as follows: “Argent three Martlets Gules, on a chief dancette of the second, an open book proper garnished or bearing the legend In Domino Confido in letters Sable between two crowns of the first." Motto: Grandescunt Aucta Labore (‘By work all things increase and grow’). The McGill logo has been designed with specific proportions, spacing and alignments that enhance its legibility and impact. These are reflected in all official logo files. The main unit of measurement for spacing used in this manual is based on half the width of the shield (or .5x). The logo, shield, Coat of Arms, wordmark and brand extensions should be surrounded by at least .5x vital space to ensure their integrity and clarity and separate them from any other text or graphic elements. Regardless of the logo’s size, the proportions remain the same. The shield should never be reproduced under .25 inches in width. In general, the wordmark should not be reproduced under 1 inch with the exception of certain special applications (see Special Applications). Remember, except in rare circumstances, it is always required to use the full logo rather than one or the other of its parts. The logo can be used in black when it is used in monochrome and duotone projects where the use of red is not possible. Whenever possible, the red version is preferred. 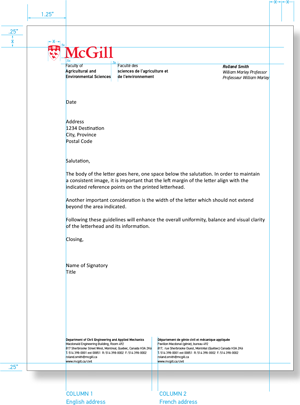 When logo is printed on McGill red or a dark background, the reverse version of the McGill signature should be used. As seen on the right, the wordmark becomes white but the colours of the shield stay the same with only a white outline added around it. The colours of the shield should not be inverted (i.e. the martlets remain red on white and the crowns and book white on red). The logo should appear on the front of all printed and digital documents. The University coat of arms, shield, wordmark and logo must not be modified in any way. The shield may never appear in any colour other than McGill red, or black, or – for special circumstances – silver or gold. The logo should always be clearly legible. Avoid overly busy backgrounds. The logo must never be used as a headline or set into text as part of a sentence. Always maintain vital space around the logo when it is adjacent to other items or the edge of the page. The logo should always be used horizontally. It should not be rotated or used sideways. 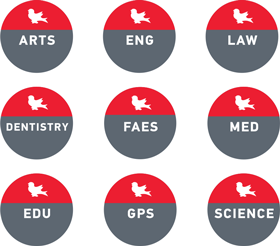 The McGill logo or the individual elements that compose it (shield, martlet, wordmark...etc) cannot be included within another logo (see The McGill Logo: Other logos). Point sizes shown here are related to the logo at minimum size and should be sized up in proportion to the logo. The whole logo can appear in either red, "reversed” or black versions. In the English extension, each word is capitalised. In the French, only the first word and proper nouns are. The horizontal option uses a black divider line of 0.5 pt thickness and the height of 3 lines of text (see One-tier extensions (longer unit names) below). The extension text block is centred vertically along the height of the M in McGill. For the vertical version, there is no divider line and the extension text block is aligned with the left stem of the M.
Although both horizontal and vertical options are available, the horizontal one is preferred. In one-tier extensions, when the units are preceded by ‘Faculty of’, ‘School of’, ‘Department of’, ‘Office of’ or ‘Centre for’, they are typeset in PF Din Text Pro Light and the unit name is set in PF Din Text Pro Medium. A three-line logo extension is the maximum. As with the bilingual version, the horizontal option is preferred. The subordinate units are set in PF Din Text Pro Light. It must not be longer than three lines. The English and French main unit names are placed side-by-side to the right of McGill (same as in the one-tier horizontal option) and the subordinate units are placed 2 pts below. The subordinate units are set in PF Din Text Pro Light. The English and French main unit names are placed side-by-side under McGill (same as in the one-tier vertical option) and the subordinate units are placed 2 pts below. The subordinate units are set in PF Din Text Pro Light. Below are two currently recognized special logo extensions. 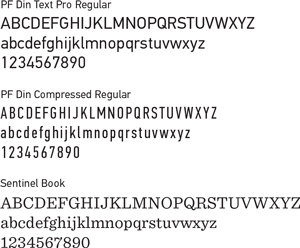 It is not possible to reproduce these extensions with standard typefaces. The words ‘University’ and ‘Université’ can be displayed as shown but are only to be used in cases where it is deemed that the logo by itself may not be sufficient to clearly identify McGill as an educational institution. In efforts to better integrate both campuses, the Macdonald Campus shield with its combination of green and gold is no longer used to separately denote the Macdonald Campus. Instead, the word Macdonald, or the words Macdonald Campus or Campus Macdonald, is/are displayed under the McGill logo, as shown. The Macdonald shield may be used only under special circumstances. Mix type weights on the same line. Use PF Din Text Pro Light for anything other than a unit designation e.g. ‘Faculty of’ or a two-tier subordinate unit (see Two-tier extensions). Use more than three lines max for any logo extension. No academic unit (including its programs) other than one covered by the Policy Relating to the Naming of University Assets may develop a secondary logo, see Online Resources. The University strongly encourages all units to use an extended version of the McGill logo, rather than develop their own separate logo. Secondary logos may be used only with approval from the logo.communications [at] mcgill.ca (Office of Communications and External Relations) and only in conjunction with the McGill logo. If you are planning to use an image consistently, e.g. for a recurring event, consideration should be given to visual identity issues, whether or not the image constitutes an official logo. The University’s named faculties (Desautels Faculty of Management and Schulich School of Music) have, with permission, created their own logos for which separate standards have been developed. Both logos are used in conjunction with the McGill logo. For further information about the branding guidelines of these particular faculties, please contact their communications offices. A few University schools are also named after a donor, like the Max Bell School of Public Policy. In cases where they have their own logo, the latter is placed in a similar manner to faculty names, that is, to the right of the McGill logo and separated by a vertical line not closer than half the shield. The vertical line’s height can vary according to the school’s logo. Care should be taken to balance the school’s and McGill's logo so that neither dominates the other visually. This logo may be used on sports equipment and promotional items. It is to be used solely by Athletics and Recreation, in accordance with standards created for its use. No academic unit, other than one covered by the Policy Relating to the Naming of University Assets, may develop a secondary logo. Units seeking to create a secondary logo must request permission from the logo.communications [at] mcgill.ca (Office of Communications and External Relations) and must work with its Graphic Design unit which will ensure that any secondary logo harmonizes with McGill visual identity standards. Graphic Design can also provide instruction as to how secondary logos may be used. Unless approved by the logo.communications [at] mcgill.ca (Office of Communications and External Relations), the McGill logo or the individual elements that compose it (shield, martlet, wordmark, logo) CANNOT be included within the new logo. 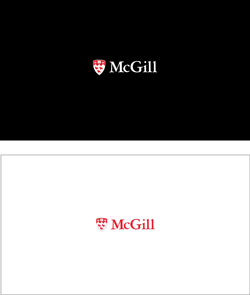 If pairing a secondary logo with McGill’s, the only accepted placement is to position the secondary logo to the right of McGill’s, separated by a black divider line, with half the width of the crest between each element, similar to extension names (see The McGill logo: Logo extensions). The secondary logo can also be placed separately from the McGill logo, but the latter must then appear prominently elsewhere on the same page. Care should be taken to balance the secondary logo and McGill’s so that neither visually dominates the other. The McGill logo may be photographed or illustrated on an item (e.g. a book or article of clothing), which is used as a main image in a concept. However, because the logo is part of the photograph or illustration, an official logo is still needed on the collateral in question. Special artwork must be used when the logo appears on materials such as glass and metal. The martlets should never appear white on a dark background. Please contact Graphic Design for special cases and artwork requests requests. When producing special types of communications, such as banners, signs or items where the size of type must be visible from a distance, type can be placed with the logo as long as vital areas are respected. For very small applications, the shield may be dropped from the logo and the wordmark may be reduced to fit. Vital space should be respected if possible. The red bird called a martlet is one of McGill’s most recognizable symbols. Martlets can be used as added elements on brochures, newsletters or any university collateral. The martlet has no feet and thus always appears in flight. Approval by the logo.communications [at] mcgill.ca (Office of Communications and External Relations) is required should you wish to use a martlet as a design element. The McGill wordmark may be used as a design element either screened or transparent and may extend beyond the borders of the actual piece, as long as an official logo adhering to the standards in this document is also present on the same surface of the piece. The University and some faculties have historical seals or emblems that date back to the early days of the University. These can be used to supplement and embellish concepts with the approval of the logo.communications [at] mcgill.ca (Office of Communication and External Relations), but an official logo adhering to the standards in this document must also appear on the same surface. The University’s visual system is used to implement the brand across various media. Official colours, typefaces and visual elements are important in creating a visually consistent graphic look and feel, ensuring a unified and strong brand. The official McGill colour, McGill red, is CMYK 0 100 90 0. For electronic display, the RGB (red, green and blue) value is: R237, G27, B47 or Hexadecimal value #ED1B2F. Pantone Solid 185 can be used when printing in one or two colours. 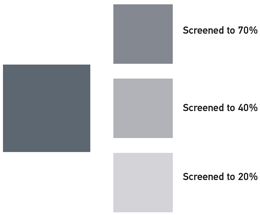 McGill’s secondary colour is grey, Pantone 431 C or CMYK 66 52 44 17. It can be used at 100% or screened depending on the usage or context. For electronic display, the RGB (red, green and blue) value is: R93, G103, B112 or Hexadecimal value #5D6770. 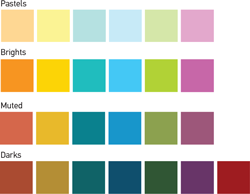 Tertiary colours, are not official but rather suggested colours that cover a larger spectrum to complement the McGill red. They can be used to add variety and contrast for headings, bullets, background and other graphic elements. These include all fonts in each family (ie: light, roman, bold, italic etc.). Only core typefaces should be used for brand extensions, official University stationery or major printed documents (posters, brochures, reports) intended to reach a large and/or significant audience. 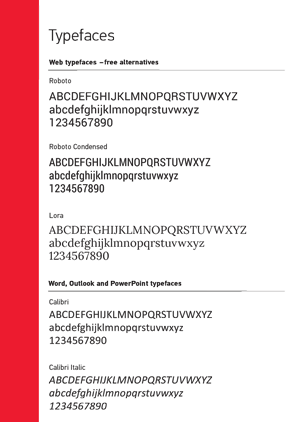 Accent typefaces can be used to visually complement McGill’s official typefaces. They are used mostly for display and should always be accompanied by one of McGill's official typefaces. 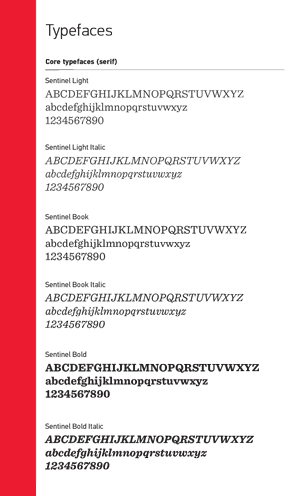 On the left are some of the accent typefaces that may be used. 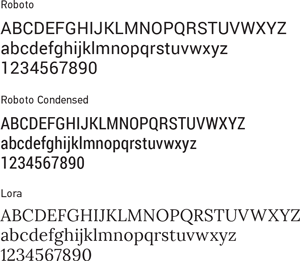 For Web projects, Roboto, Roboto Condensed and Lora, which are free Google Fonts, can be used as stand-ins for PF Din, PF Din Compressed and Sentinel respectively, if budget does not allow for the use of the latter. They exist in different weights and styles. This substitution is approved for Web only. When sharing Word, Outlook or PowerPoint files with a large number of people, it is best to use a system font for the body text so that installation of a new typeface is not necessary. In these instances, we recommend using Calibri. Photography plays an important role in presenting a professional look to communications, and presenting McGill as a dynamic and vibrant place to work and study. Proper lighting, subject matter, focus and cropping are important elements in creating a strong and consistent visual quality across publications and websites. Complex, busy, or low-quality photos should be avoided. Whenever possible, professional photographers or stock sources should be used if high-quality images are not available from appropriate campus resources. 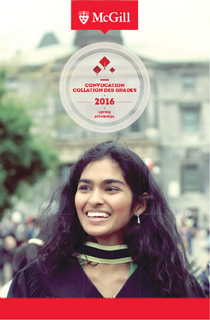 The Office of Communications and External Relations maintains a bank of photos for use in McGill publications. You may also contact laurie.devine [at] mcgill.ca (The Office of Communications and External Relations) for information about providing proper credit for photos. The University stationery includes both printed and electronic letterhead, business cards, envelopes, memos, fax sheets, notepads, and e-mail signatures. The samples shown here present the maximum amount of information that would likely be included. Most cases should have less information to display and therefore appear less crowded. All information is printed in black or McGill red. McGill Printing Services is the official supplier of McGill letterhead and stationery. Printing Services can also provide units with electronic versions of their letterhead. Units are encouraged to work with Graphic Design should they have more customized stationery needs. Official University letterhead, both printed and electronic, is disseminated around the world. Although e-mail is now the more common form of correspondence, much of our official communication is still sent via printed letterhead. 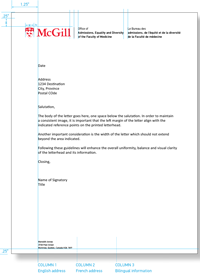 It is therefore important that the information on all McGill letterhead be organized and well presented. All letterhead used by the University should be bilingual. The standard letterhead is as shown. A unit name can appear as a standard logo extension and/or at the bottom left column. McGill Printing Services has templates for all McGill stationery and should be used for typesetting and printing these items. When a McGill entity has an affiliate or partner, the affiliate’s logo should be aligned as shown, in the top right corner. This area has the most space to add other signatures and logos without encroaching on the writing area. For customized electronic letterhead, contact Graphic Design. For business cards, the logo extensions are the same size as previously specified. The address and contact information is set in PF Din Text Pro Light 7.5/9 pt. Names are set in PF Din Text Pro Medium Italic 8.5/9 pt, and credentials and titles in PF Din Text Pro Light Italic 7.5/9 pt. There is a +3 point line spacing between name/title and the address. E-mail addresses should be written out below the above coordinates, followed by web addresses, where required, on a separate line. 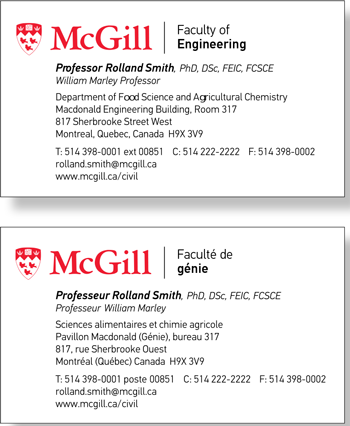 The McGill business card is bilingual, with each language printed recto verso. Approved secondary McGill logos may be added to the right of the black line. The faculty name then moves down after the department name in order to make room for the secondary logo. The logo size must not be larger than the McGill shield. 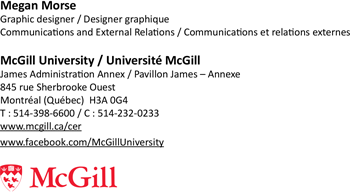 A McGill business card should not incorporate the logo of an external institution, as this practice incorrectly suggests a formal institutional relationship. McGill graduate students can obtain business cards through Printing Services, with the authorization of the academic unit where they are registered. 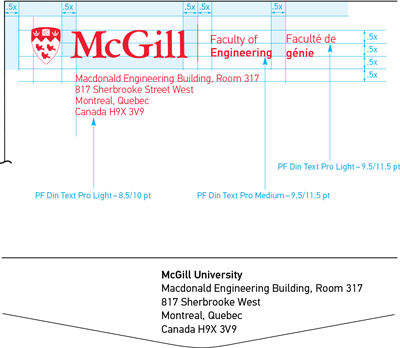 Whatever size the envelope, the McGill logo always appears in the top left corner as shown. The unit extension appears to the right and the return address can either appear below or on the back flap if it is deemed too lengthy. Mailing labels are used for oversized envelopes and packages. The standard mailing label size represented here is 4.75” x 2.75”. In this example, the logo, extension and address are reversed on a McGill red band. This is the suggested email signature format for administrative and academic units and departments. On PCs, the typeface is set in Calibri. Department’s website and social media links (optional): Calibri regular, 9 pt, underline, clickable links. For social media links, if any, it is best to link text instead of icons to avoid visual clutter and conflict with the McGill logo. It’s best to include the “www” in the web links so that a hyperlink is automatically created in the email program. 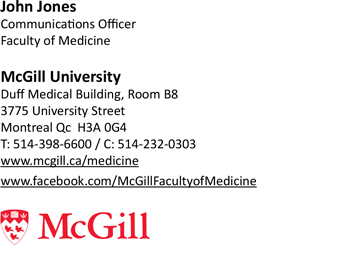 The pre-formatted McGill logo for email signatures can be downloaded from the visual identity website. You can also choose to have a bilingual signature. However, for simplicity’s sake we recommend that the address be in French only. This section covers websites created outside McGill’s WMS. Units are encouraged to work with McGill’s Digital Communications team for support when looking to build a new website. The primary colours of any McGill web property must match the McGill Core Palette. Under certain circumstances, accent colours (representing 10% or less of overall visual real estate) may be used. For more information, contact web.communications [at] mcgill.ca (Digital Communications). Other typefaces may be used as accents (representing 10% or less of all on-screen text). For more information, contact web.communications [at] mcgill.ca (Digital Communications). In order to maintain consistency across McGill web properties, the header must feature the McGill logo and unit name/identity as described in The McGill Logo: Logo extensions on horizontal logo extensions. Note that the logo and its extension must meet the standard space contrast and black-divider-line requirements. Aside from respecting general best practices for site navigation schemes, there are no other requirements for the header. Colour, layout and styling can be freely adapted to meet the needs of the sponsoring unit and their audience. McGill web properties use a standard footer featuring white and very light grey elements on a dark grey background. 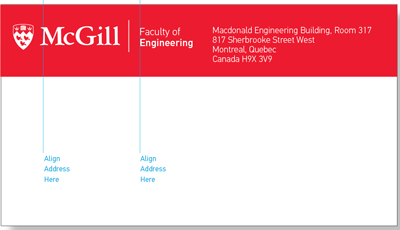 Repetition of horizontal McGill logo and its extension with contextualizing phrase clearly explaining the site or project’s relationship to McGill, with the words ‘McGill University’ providing a link back to www.mcgill.ca. Search feature, unless the site already provides a search field that is visible at all times (ex. part of a header that follows the user as they scroll). Expanded site architecture showing the complete contents of the site navigation scheme. McGill has a central Google Analytics installation that includes all McGill-branded and sponsored websites. All new websites must embed the tracking code on the left in order to be included in the central dataset. All official McGill sites must use a mcgill.ca URL: either sitename.mcgill.ca or mcgill.ca/sitename. The official McGill favicon is the red martlet as seen on the left. It is available in .png and .ico formats; .ico is preferred. The favicon should be associated with all pages of all McGill-branded sites. The favicon may be obtained by contacting web.communications [at] mcgill.ca (Digital Communications). Use of a project-specific, professionally designed icon suite is permitted, provided the icons are used in a way that is accessible and compliant with best practices. Where this isn’t possible, McGill recommends using Google Material Icons: an exhaustive set of scalable and user-friendly icons. The public-facing side of a McGill-branded website should bear no mention of the platform (ex. WordPress, Drupal), vendor, or other service provider implicated in the creation, maintenance, or hosting of the site. This section covers McGill-branded video. Units are encouraged to work with McGill’s Video Production Services when looking to produce original video content. 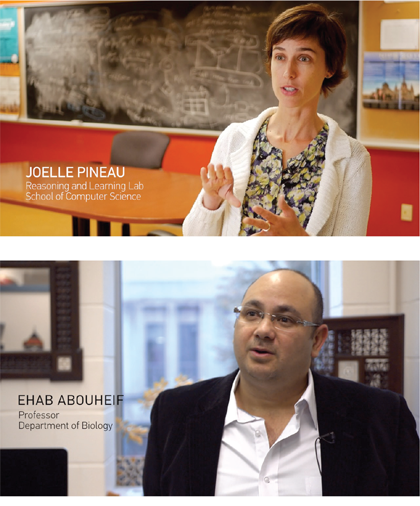 Wherever possible, official McGill fonts should be used for creating video captions. In most cases, PF Din Text Pro regular and PF Din Text Pro light will be used. Given the variations in editing software, point sizes cannot be standardized. However, good examples of the correct scale may be found in the examples on the left. White type should be used wherever possible and captions should be placed on darker backgrounds. Backgrounds can manually be darkened, if necessary. If there is no darker area, then black may be used. Proper names are spelled out in all caps. Stacked beneath the proper name in regular font is the job title and/or the affiliated Lab/Department/School/Faculty/Unit. The McGill logo (and its extensions, when applicable) as outlined in The McGill Logo: Space and size should be used for McGill-related videos. Whenever possible, the logo should be placed on a white or black background as seen on the left at the end of each video prior to credits. Logos should be centred on the screen and set no smaller than 300 pixels wide. The McGill logo (and its extensions, when applicable), as outlined in The McGill Logo: Space and size, should be set on a white or black background. 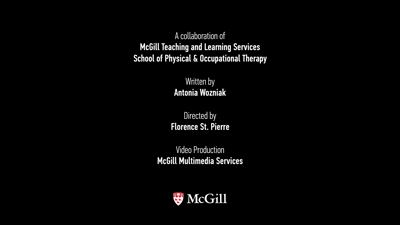 Official McGill fonts should be used for closing credit type. In this example (right), PF Din Text Pro thin and PF Din Text Pro regular are used. This section covers McGill-branded social media channels. It is very important that McGill’s social media channels also project a consistent and coherent look. As such, official social media avatars and high-quality “cover” photography (see Visual System: Use of photography) are required. Please submit a customized avatar request form for your faculty, department or unit. Avatars may be created for Facebook, Instagram, LinkedIn, Twitter and YouTube. This section covers McGill-branded vehicles. The McGill logo extension (see The McGill Logo: Logo extensions) is used to brand University vehicles. The logo extension is placed on both driver and passenger side doors and the McGill logo should appear on the back. Either option A or B can be chosen but the same option has to be used for both side doors. Please contact Graphic Design for decal production. A number of resources exist to support the use of these visual identity standards. 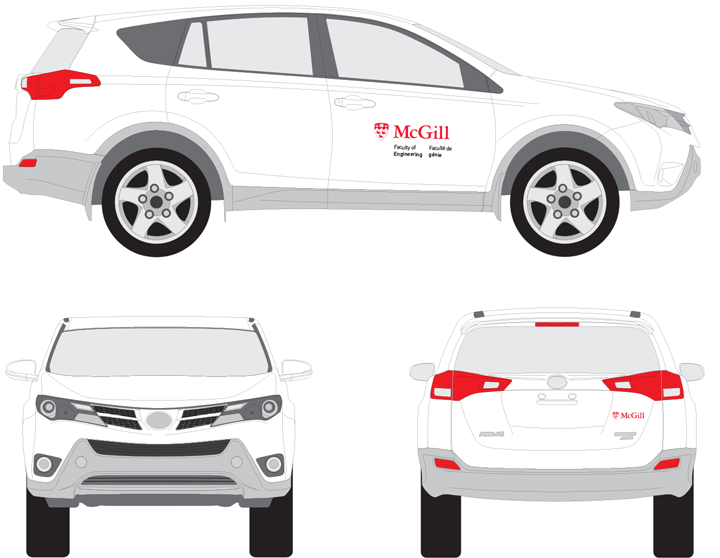 The various formats and versions of the McGill logo, along with explanations about which to use when. Download a logo. 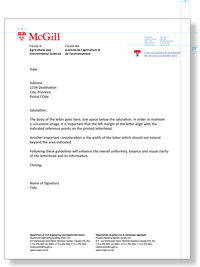 For students and other third parties wishing to use the McGill logo or other McGill trademarks, consult the McGill Trademark Policy. Policy Relating to the Naming of University Assets. Contact the Graphic Design unit for all design needs, including questions about templates and logos. Graphic Design is also in charge of creating the campus’ lamp post banners. Contact the Media Relations Office to request photos from the University’s image bank or ask questions about use of photos. To obtain business cards, letterhead or other standard stationery, contact Printing Services. For customized stationery needs, contact Graphic Design. Contact the relevant unit for more information. Contact Digital Communications for information regarding McGill-branded websites.